Actually, there are a ton of great resources on this blog, along with links out to even more resources, but the focus is really on the wonderful maps....and by "focus" I mean that's as far as I'm able to get without wanting to abandon today's post to spend the day perusing the rest of Dyson's blog. 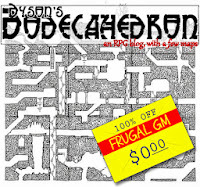 If you just need to whet your appetite without going whole-hog on this offering, a wise precaution if you only have a little time to spend online today, then I would suggest checking out Dyson's Delve, which is a free "mini-mega dungeon" designed to take a group of 4-5 D&D Basic Set or Labyrinth Lord PCs from level 1-6. The end of this adventure has all of the maps laid out & unkeyed so you can use as you see fit. You owe it to your players to go and check out this site. Not only do you pimp my blog, but you went through the effort of making a custom header/button for it? Rock on my friend, rock on!